Our sister company, Twentinox, manufactures flexible metallic fabrics for architecture, interior design, and artistic applications. The fabrics are used for metal façades / metal facades, sunscreens, ceilings, room dividers, curtains, etc. Because production is done in-house, Twentinox is able to vary in wire gauge, mesh width, and finish (brass, bronze, gold, silver, electro polish, electro colour). Both aesthetically and functionally many application options may arise. Twentinox products are manufactured from recycled materials, are extremely durable, hygienic, fire resistant and easy to maintain. Twentinox works closely with architects and designers to assist and advise throughout the project. The company has developed its own fixation programme: Customized Standard. These are standard fixation solutions for various applications of our materials. This allows clients to design aesthetic and affordable solutions with standard components available. The metal façade of a new Amsterdam pop concert hall that seats 17.000, is wall-covered with a translucent Twentinox metal fabric. The metal shield serves as framework for LED panels, to broadcast corporate identity. 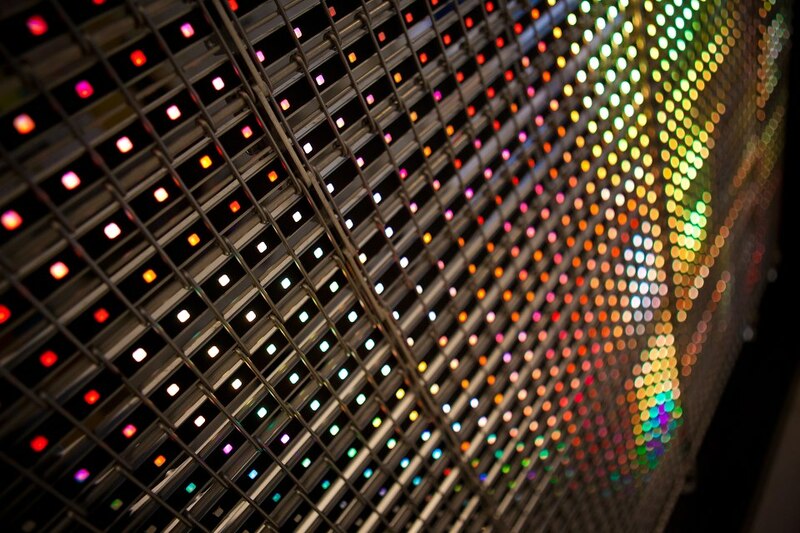 Integrated modular LED panels show upcoming events in advanced resolution.